Barack Obama delivered the speech he needed to, energizing his base and sending the faithful out of North Carolina fired up and ready to go. The convention gave the President a much needed boost in the polls and set the stage for the campaign’s final stretch run. The convention’s final night had a rock concert like feel. In between the parade of speeches were performances from musicians the likes of James Taylor, Mary J. Blige and the Foo Fighters. 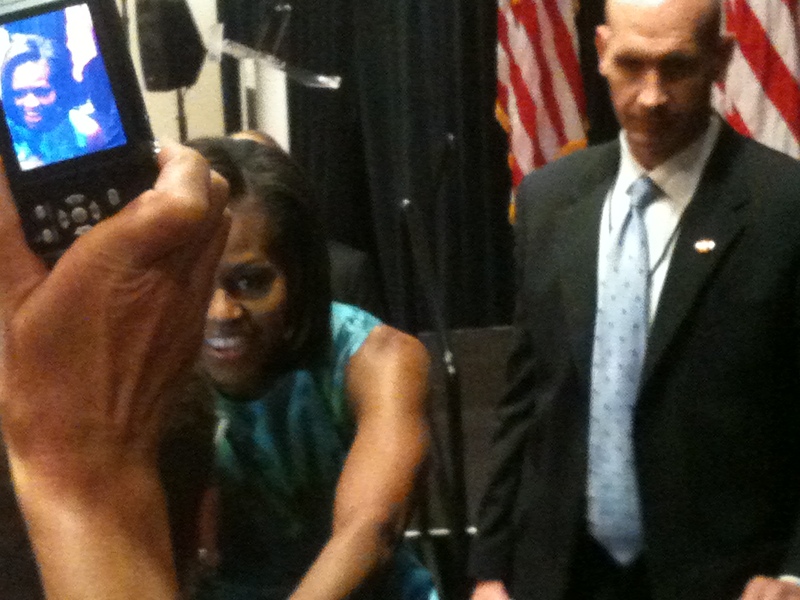 There were also moving videos from Democrats across the country and tributes to US troops stationed abroad. Surprisingly, Democrats had outflanked Republicans on issues of defense and national security. While Mitt Romney failed to even mention the troops during his acceptance speech at the GOP convention in Tampa, President Obama’s decision to go after, and subsequently kill, Osama bin Laden was duly noted in nearly every speech in Charlotte. “Osama bin Laden is dead and General Motors is alive,” declared Vice President Joe Biden. 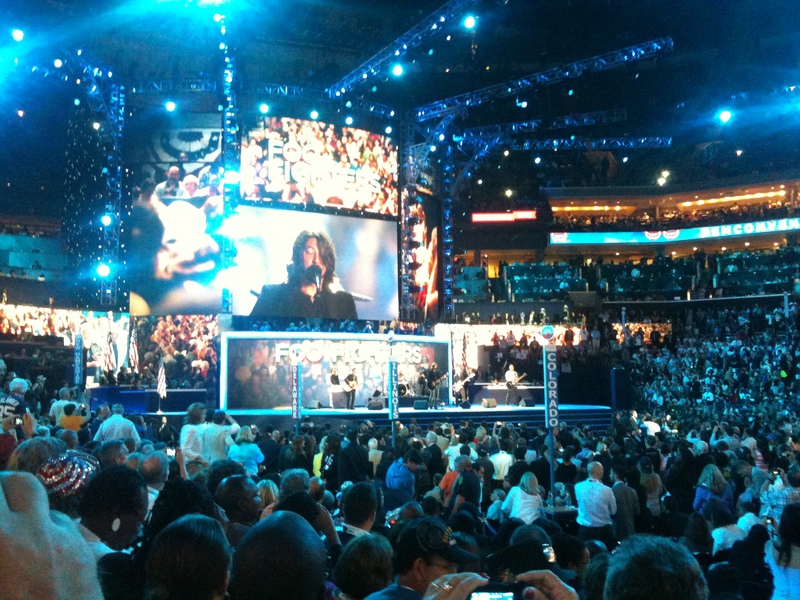 The Foo Fighters rocking out at the DNC 2012. I had arrived at the convention early, prepared for an eight-hour day. Pat and Brenda were waiting, having already claimed our seats in the Florida delegation. Man did Florida have great seats, thanks in part to the state’s all important battleground status, its coveted 29 electoral college votes and being the home of DNC chair Debbie Wasserman Schultz. Debbie even paid a visit to the delegation before her speech and we gleefully snapped a few pictures with the distinguished congresswoman. But it was another Floridan who would grab even more attention that night for completely different reasons. His name was Charlie Crist. Yes, the former Republican governor of Florida was granted speaking time at the Democratic National Convention much to the surprise of many a political observer. Crist had been basically run out of the Republican party for his “moderate” views and an infamous hug of President Obama that did not sit well with the GOP’s base. Seeing the handwriting on the wall, Crist left the GOP and ran for US Senate as an Independent, losing to Tea Party darling Marco Rubio in a three-way race which included a scandal saddled Democrat, Kendrick Meek. But here in Charlotte was the beginning of Crist’s comeback — an opportunity to curry favor with party bosses for a future run of some kind. I saw it as a payback from Obama, acknowledging Crist had suffered from his embrace and rewarding him with a primetime spot, on the convention’s final night, to state his case for redemption. When Crist was announced over the PA system about half of the Florida delegation rose to its feet, myself included. “Why are we applauding him?,” asked the wise cracking geezer from Fort Lauderdale sitting next to me. “Because he is from Florida,” I replied. I didn’t because I wasn’t politically engaged during that time, but like Crist, I had been a Republican so I could identify with his plight. And soon, people were identifying me — from all across the country. Unbeknownst to me, television cameras had been quick to capture the reaction from the Florida delegation to Crist. There I was, front and center, clapping away. Once I had left Time Warner Arena and my i-phone service had been restored (communications were jammed throughout the day) messages began to pour in from friends who had seen me on television. Some of the messages were from people I had not talked with in years. People who were no where to be found when I crashed out of the Panama City News Herald four years ago. Funny how fame works. David and I left Charlotte the next morning bound for my brother’s house in Alabama before reaching the Florida Gulf Coast. The trip felt like Sherman doing a reverse burn through the Deep South. I had been away for six months, but little had changed. Romney had the region locked up with the exception of Florida. I eagerly looked forward to the campaigns in my home state, knowing 2012 would be much different than 2010. I was healthy again, had money in my pocket and, best of all, my name was not on the ballot. I have a feeling Charlie felt the same way. I landed in Charlotte with a headstorm of energy — and Democrats sure needed it. Dismal employment numbers and the Supreme Court’s recent decision to uphold the Affordable Care Act (aka ObamaCare) had left the President’s re-election campaign in a vulnerable position. Luckily, the Republicans had nominated a Plutocrat in Mitt Romney who had failed to energize the Grand Old Party’s base. If anything got Republicans motivated to oust Obama, it was the Supreme Court’s ObamaCare verdict. 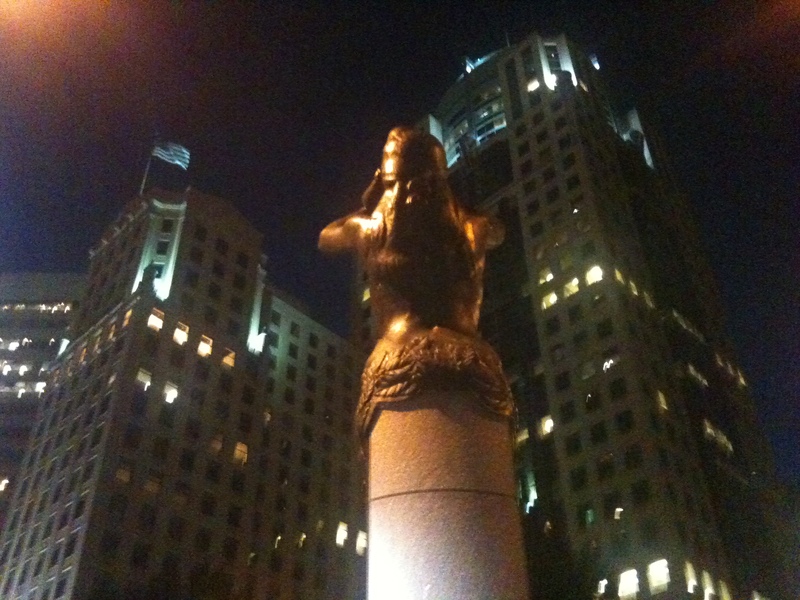 Evening hours in downtown Charlotte. Barack Obama’s signature piece of legislation was wildly unpopular in the Southern red states. It was bad enough they had to accept his Presidency, but a reform of America’s health care system was just too much for Joe Six Pack to take. And yet here, in the heart of the old Confederacy, the Democratic Party had gathered to nominate President Obama for a second term. There were already signs of trouble on the horizon. Romney was leading in the polls in both North Carolina and Florida — states Obama had carried four years ago. David picked me up at the airport. He rented a car in Panama City and drove up for the convention. I was surprised he had been able to become a delegate. Although the Florida delegation was one of the larger ones, most of the state’s power and influence came from the southeast counties of Miami-Dade, Broward and Palm Beach. For someone from the Panhandle to break through all the horse trading that goes on leading up to delegation selection was truly remarkable. I just didn’t think David was quite that shrewd. He is loyal, however, without a shadow of a doubt and I was glad to see him again. I wondered if he recognized a difference in me. Our hotel was in downtown Charlotte, which was surrounded and guarded by the largest police and security presence I had ever witnessed. All of the cops in their urban riot gear reminded me of some scenes from the latest Batman movie. The media were everywhere as well. 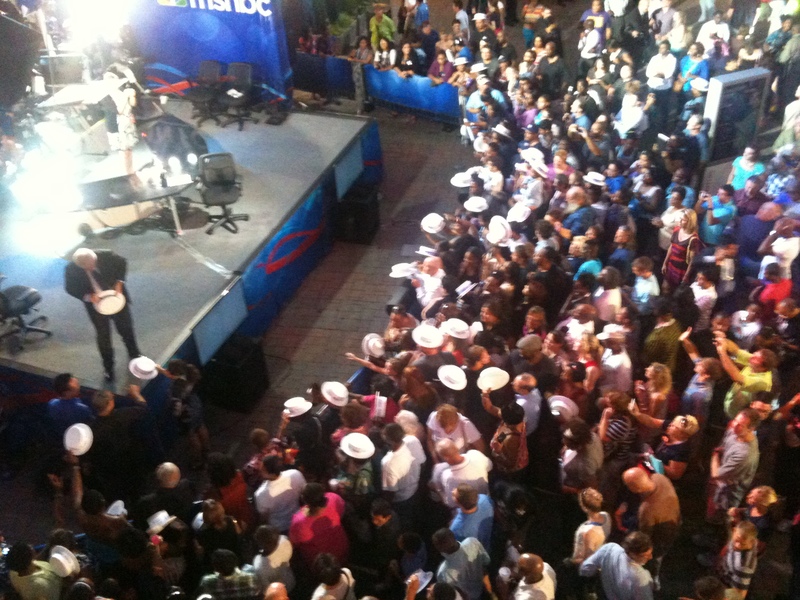 MSNBC had its own “village” where the cable network broadcasted several of its daily shows live to masses of adoring fans. On my first night in town, David and I managed to get close enough to the cameras to show up on Chris Matthews’ Hardball show. During the commercial break, I gave Chris a thumbs up and he smiled. It was a clear connection. The next morning we attended the Florida delegation breakfast, listening to politician after politician speak about the importance of the upcoming campaign. There we were joined by Pat and Brenda, two ladies from Bay County, who much like David had successfully navigated the delegate selection process into a ticket to Charlotte. Brenda was a fresh new face in Panama City politics, pumping much needed vigor into the women’s club. Pat, a yellow dog Democrat if there ever was one, had been a vital financial supporter of my run for state representative and was known for speaking her mind. MSNBC host Chris Matthews meets his fans. In a room full of power suits and enormous egos, I came down to breakfast in a pink Lacoste polo, khaki shorts and flip flops. I was comfortable in my own skin and never felt the least bit awkward or intimidated. This was a huge jump from four years ago when I was scared to leave my room, scared to go to Wal-Mart. Just plain scared. I cannot begin to explain how much the Canyon had worked wonders on my human spirit. All those hikes had filled me with strength and confidence, only now I had the compassion and humility to go with it. The confidence I exuded before from influential journalism jobs was, admittedly, filled with arrogance and entitlement. While I am indeed grateful and fortunate to have lived a life of great privilege for thirtysomething years, the hard times of the last four years had reshaped my world view and given me much needed perspective. I knew the Romney crowd we would be battling. I knew them intimately and I knew their weaknesses. The ground game would be where this campaign would be won.